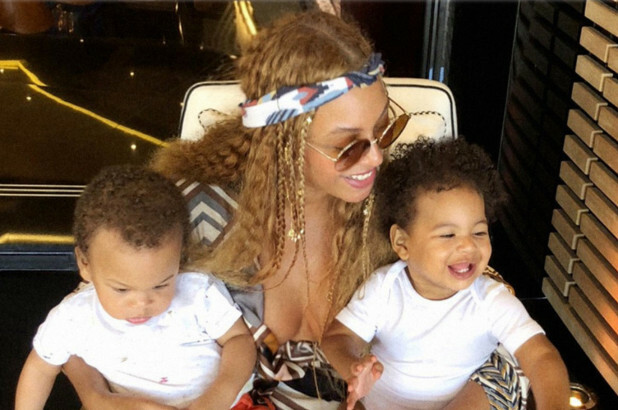 Want to see how big Beyonce‘s 18-month old twins Rumi and Sir are now? The “Apesh*t” performer and her hubby Shaw “Jay Z” Carter with their eldest daughter Blue Ivy and other family members headed out to Prospect Park in Brooklyn, New York on Christmas Eve to admire, snap and celebrate a new park bench dedicated to Jay’s grandmother, Hattie White. The celebration was a private affair as they were not ornately dressed and did not invite the press or anyone else to tag along. Nonetheless, news leaked and paparazzi caught lots of pics that can be seen over at the Daily Mail! Bey was outfitted in a large white floor length parka with her long waist length braids parted down the middle and she wore no make up, it appears. Blue had on an army green parka and jeans with the twins outfitted in coordinated pants, Timberland boots and parkas. The guest of honor, Ms. White, was photographed with her hand over her heart looking in awe and amazement and later with her twin great grandkids on the bench. Her grandson, “444” producer was also casually dressed for the occasion that took place a day before the family boarded a private jet back to Los Angeles for Christmas! The family has had an incredible year that included their tremendously successful “On the Run II” Tour, Bey’s Coachella performances and a hit joint album that garnered lots of Grammy nominations and critical acclaim! The year culminated fantastically during a show stopping performance in South Africa at the Global Citizens Festival!